FILE - A wind turbine overlooks the coal-fired power station in Gelsenkirchen, Germany, Dec. 1, 2014. Divisions deepened at the U.N. climate talks Thursday, pitting rich nations against poor ones, oil exporters against vulnerable island nations, and those governments prepared to act on global warming against those who want to wait and see. 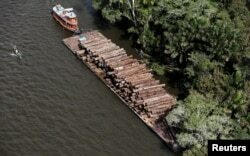 FILE - Logs that were illegally cut from Amazon rainforest are transported on a barge on the Tapajos river, a tributary of the Amazon, near the city of Santarem, Para state, April 18, 2013. * Several oil-exporting countries have objected to the idea of explicitly mentioning ways in which global warming can be kept at 1.5 degrees Celsius (2.7 degrees Fahrenheit). 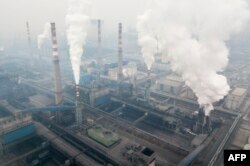 The Intergovernmental Panel on Climate Change, a body made up of scientists from around the world, recently proposed "policy pathways" that would achieve this goal, which foresee phasing out almost all use of coal, oil and gas by 2050. FILE - Pollution is emitted from steel factories in Hancheng, Shaanxi province, Feb. 17, 2018. "We have renewable energy," she said. "It is displacing coal in the U.S. and in Europe, and it is expanding elsewhere.